You can give us gamers all the fanciest gameplay mechanics in the world, but at the end of the day, drop a marble onto a piece of track before asking us to move it to the other end and we’ll be as happy as a pig in muck. 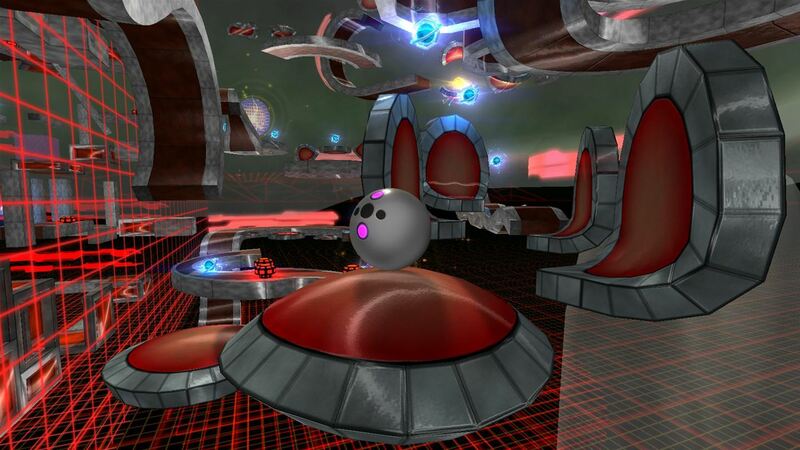 History proves this to be the case and the likes of Marble Madness, and then Marble Blast Ultra, have gone down massively well with the gaming community. Now though we have Marble Void – a game which even the developers admit has been hugely inspired by both titles that have come before it. But with the gaming scene pushing new levels on a daily basis, is there still room for a simple marble tracker? Good god yes! Especially when it comes in at such a low price. Marble Void places us into a retro-futuristic 3D platforming world in which we must pilot our marble through puzzles and across obstacles in order to complete stages. Our skills will be tested no matter whether we’re going for a timed speedrun, just hoping and praying we’re able to make it to the end, or, and this is the most addictive part of Marble Void, heading out on a casual orb collection procedure. I don’t know about you, but the second I see something to collect, I just have to go and find them. When that thing is an orb, it just happens to hit my addictive nature even more. The game itself comes with more than 40 stages split across Easy, Medium, Hard and Extreme level tiers, and whilst you’ll probably find the former levels a bit too simple, the game itself really kicks on once the mid-range puzzles are sent your way – before then eating you alive with the Extreme ones. Thankfully should you start to fail, loading and respawn times are super quick so it is only a mere second before you are back in the game. 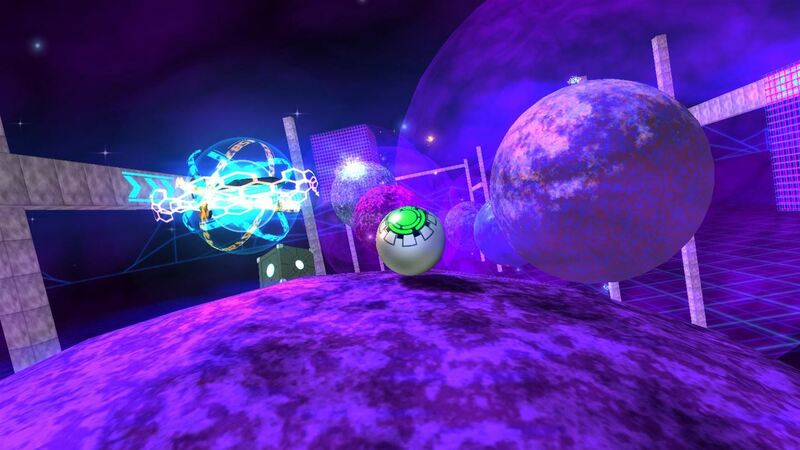 As you would expect from a game based around a marble, the star of the show is the small sphere-y thing itself. It comes with a well weighted form, and requires a degree of skill and control in order to safely navigate it through each stage. With a simple control scheme that revolves around the left stick for movement, the right for scouring the way ahead and a face button to initiate the single jump, you could be forgiven for thinking Marble Void is going to be a bit easy. And it will be initially but once the likes of bumpers, moving platforms, switches, teleporters, boost pads and some brilliant gravitational switches come into play, things get real complicated, real fast. I mean, seriously, I’ve had a decent amount of hands-on time with Marble Void and completely understand what is needed to survive, but even the very first jump on the very first Extreme level is enough to send anyone over the edge. Whilst many will find themselves happily trying to pick up medals and recognition for making it to the end of each stage, and a good few of those will feel the need to head back in again in order to beat a gold, silver or bronze par time, it is with the orb collecting that Marble Void begins to excel. 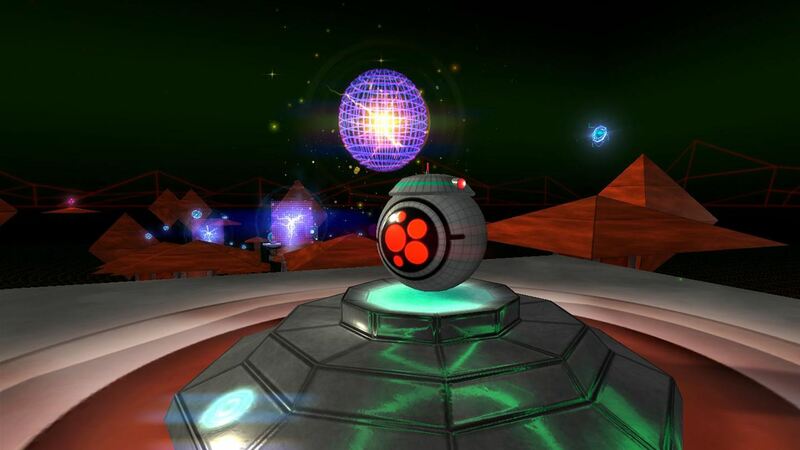 You see, scattered around each level are numerous glowing spheres and it is these orbs which are the real key to your success and enjoyment. Coloured blue, yellow and red, each are worth one, five or ten points respectively and can then be used to unlock future stages without the need for earlier completion. Whether there are further colours worth more in the insanely difficult levels, I couldn’t possibly say, but come back to me in a decade or so and I may just have found out. The whole collection scene is a great way of ensuring that more of the game is made open to even the lesser skilled players, and gives everyone something to aim for. 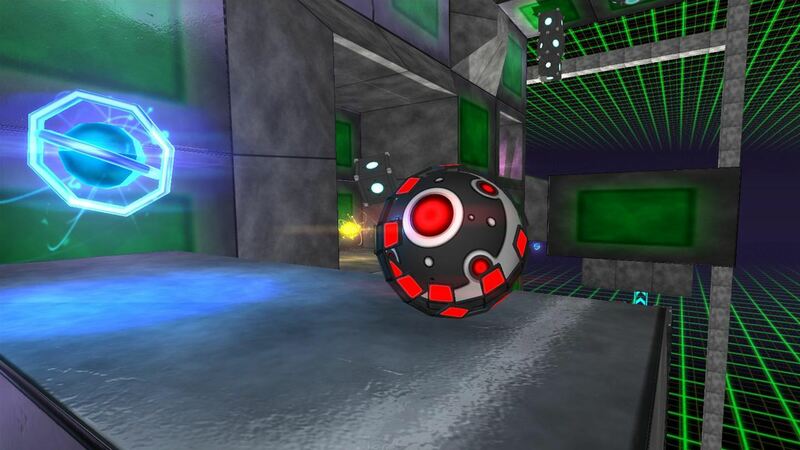 You can also use these orbs to purchase different skins for your marbles – and whilst that is quite a pointless exercise, further unlockable minigames and extras are much more exciting. You’ll have to have gathered up plenty of orbs in order to unlock all of these options, but it’s good to see a reason and meaning to the whole idea, other than just letting you skip levels that are too tough. The Infinity Editor, and it’s close cousin the Infinity Player, are nice touches, allowing those with a creative streak the opportunity to edit and play, whilst the Endless mode gives Marble Void players something to waste a few minutes with should they ever find themselves having completed everything available in the main game. It is however the Orb Drop addition which is the really exciting inclusion though as it is nothing short of addictive and sensational. In fact, it is so good, that it really does need a standalone, refined, version of its own. 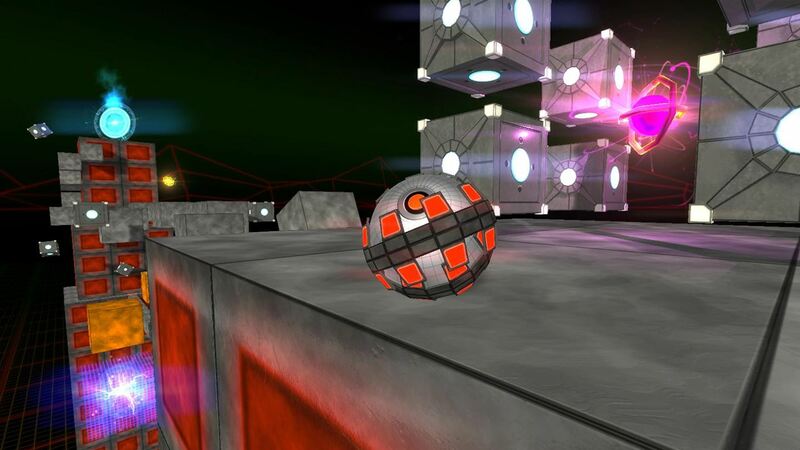 The Orb Drop will let you gamble your precious collected orbs in the hope that you can win more, by sending a ball down a board in the hope you’ll land in the segment at the bottom which holds the biggest prize. To get involved you need to stump five points up before you see the board, and then it’s all left to luck as your ball drops and pings like in a pinball machine around a static table. Now, much like whenever I go to the casino, profit is far from nailed on and I’ve happily knocked an hour or two into the mindless dropping off balls in the hope I’ll eventually turn around my current deficit. I’m not sure it’s ever going to happen, but I’m going to keep throwing in those marbles in the hope it will. Whilst I’ve probably had too much fun in the Orb Drop mode, Marble Void as a whole really does have all the basics for a hugely addictive, highly promising game. But there are some major issues within the visuals which will put many off. Thankfully nothing has put an utter stop to my game time, and the futuristic look the developers have delivered is a good one, but constant frame rate issues, lag and stutter are more than prevalent. It obviously happens more when there is a lot going on, with multiple moving platforms, and swirling planets with their own gravitational pull being the main culprits, but even without those some of the most simple stages also seem to be afflicted. And that’s a shame because I know how fickle some gamers can be, even with a game that costs next to nothing in cash terms. You see, sanity, time and effort are much more important to some than money, and issues like these will be enough to see a game dropped like a hot grenade. If only the developers at Leveled Games could shoot out a patch to fix these lagging problems then I’d not hesitate to recommend Marble Void to any lover of the genre. Away from the visual problems and the soundtrack isn’t half bad either. It does get very repetitive though, and I’ve found the very best way to enjoy Marble Void is to keep the sound effects on but to switch off the music. A further bug is present whenever you pause the game too, with the level name and your best par time replaced by ‘INSERT NAME HERE and BEST RECORD: 9:99.’ I understand that Marble Void is a budget title, but surely it isn’t asking too much for that to be fixed? As it stands, it is the price which will ultimately dictate things. For less than five dollars, Marble Void is well worth the punt… especially if you’re one of those who are looking for a new marble fix. It’s not as good as the likes of Marble Blast Ultra from years past, but it’s a solid entry with a great price. But please fix the frame rate issues.